To hyphenate, or not to hyphenate—that is the question at hand today. So there it is, you’re a noncommissioned officer, and now you have to write out your new job title. How do you write it? 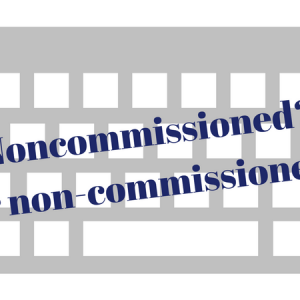 Is it noncommissioned officer or non-commissioned officer? Some might argue that it simply depends on who you ask. Other, more resourceful and thoughtful, know better. They know where to look to find the correct answer. And yes! There is a correct answer. What you need to find the answer is a writing style guide and a dictionary, which lucky you are both just a Google search away. We all learned in high school English the important grammar rules, but once you get into the real world, those rules are harnessed and perfected for today’s world in writing style guide Any institution using the written word should specify the one they use, or likely has their own. Some of the more common style guide’s include the Associated Press Stylebook, the Chicago Manual of Style and Modern Language Associate style guide, which dictates the format most commonly associated with college papers. The Defense Department offers a Visual Information Style Guide filled with helpful information such as how to write commonly used words, when and how to use contractions and the best way to construct a photo caption. Available online, it also lists several resources and other style guides to reference in case you don’t find your answer. Go ahead and bookmarked this webpage, any good writer keeps a resource like this readily available. Seems pretty straightforward, but stay with me. Even the people making the rules get it wrong sometimes. The Army.mil website has its own style guide and it’s also available online. This style guide is based in part off the DoD’s guide and it incorrectly includes the hyphen within the document when explaining not to hyphenate “non-commissioned officer in charge.” Anyone just glancing at this document could easily get confused. 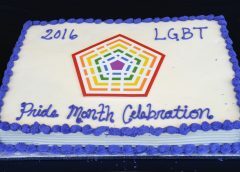 Hyphenate? Or no? 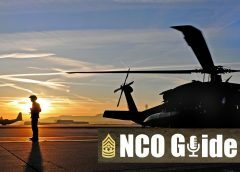 If we as NCOs cannot get it right, how can we expect others? As the keepers of our own tradition, we need to police ourselves and our ranks to stay consistent. I know you are thinking, who cares? It’s just a hyphen. But the ability to write clearly, correctly and effectively is a sign of a competent, detail-oriented leader. Whether writing emails, briefs, on whiteboards, training documents or quick notes to others or ourselves—it’s important to keep this in mind. Not just when writing noncommissioned officer, but anything that may trip up the average person. You’re a leader—be exceptional!